In Pakistan, breakfast in served at noon. I love any country where you can wake up at 10:00am and the host asks why you are up so early. It was the morning after the Sangeet, and Hindu women from Karachi and surrounding villages in Sindh gathered in the living room of my host family for an hour of singing and dancing. I had expected something less formal compared to the previous evening, but when the women came, I was surprised at how dressed up they were for a midday event held in a living room. There were so many woman squeezed into the house that we danced around the sitting women, the tips of our colorful dupattas sometimes grazed a sitting guest. After the dancing commenced, a lunch of rottis and vegetable curry was served to the guests. Plates were passed around from all sides, and bread and curries were dolled up from large pots. We sat on the floor at ate with our hands. At 2:00 pm it suddenly became urgent that we leave for the parlour to get our mehndi done. Mehndi is the art of applying henna to the hands in an elaborate design, and is usually reserved for special occasions such as weddings. 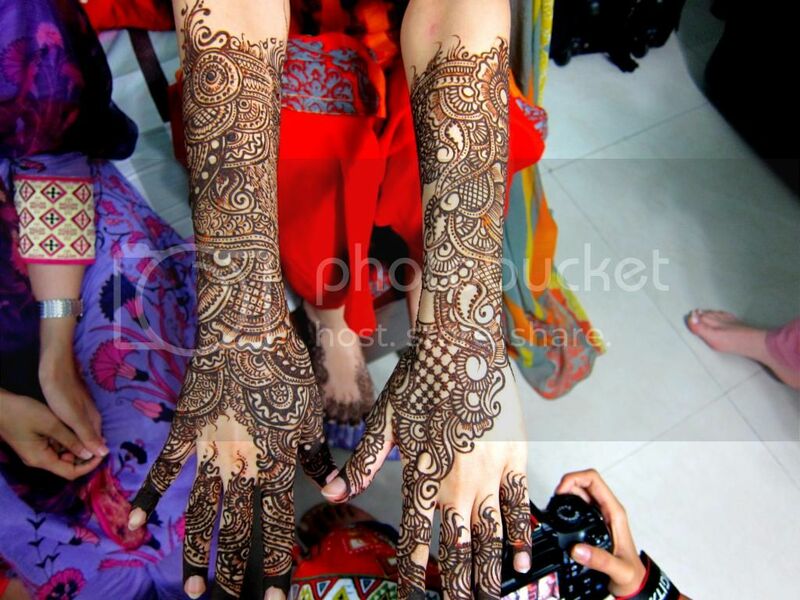 In Pakistan, only the bride applies henna up to her elbows and on her feet. 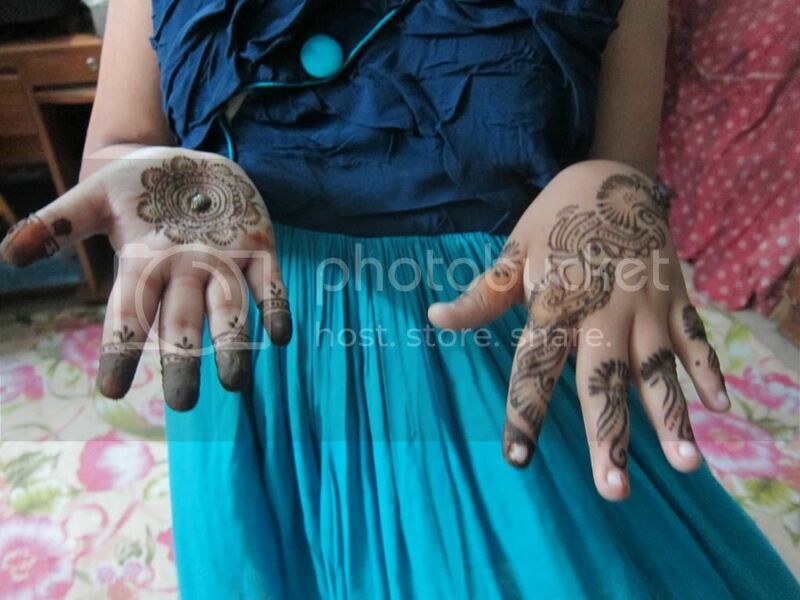 The female guests are limited to designs on their hands, so as not to outshine the bride. The bride and her cousin left in one car for a parlour, whereas her sister, two cousins, and I would be going to the market to find another place. The car dropped us off at the bazaar, the same one which housed the jewelry store I visited on the first day. Surrounded by disfigured buildings, people maneuvered through a puzzle of cars and street carts into tiny, unmarked shops. The parlour was on the second floor, and had only a curtain for a door. When we pulled back the curtain we were shocked to see that the parlour was scarcely bigger than a bathroom. It had only two chairs, both of which were occupied by women getting hair cuts. I had assumed that this place was purposely chosen by my hosts, but apparently no one had been there before, and when we looked through the catalog of their mehndi designs, the cousins acted very unimpressed. “I want elaborate mehndi,” one said, “this is too simple.” So after some time it was decided that we would go to another parlour for henna. The youngest sister began calling other parlours in Karachi, but they were all booked. Defeated and uncertain of how to proceed, we called the driver and returned home around 4:30. I was told we would be getting mehndi done at the house of the family’s former servant. She was a very poor woman, so she would appreciate the money, and besides, all the parlours in the city were full. At 7:30 our driver careened through the dark alleys of Karachi until we came up a hamlet of tiny concrete structures surrounded by a wall. The driver pulled his car right in front of the gate and we hurried from the car door through the entrance, careful not to linger for any time in the street. When I imagined the home of a servant, I had expected a small hut, but instead I found myself in a sprawling maze of concrete hallways and rooms. The hallways themselves had no ceiling, but the rooms did. There were no doors, only curtains to separate the rooms. Although old and in obvious need of repair, I thought the house seemed like a large and specious living quarters. We were guided by the sister down the long hall and through a curtain on the right, where we suddenly found ourselves in the room of the former servant. She was an old woman, in a bright orange shalwar kameez. A young man slept on the floor, atop a bed that was made of three naked couch cushions placed side by side. Two girls sat in the corner, silently watching us. The old woman greeted the sister, and the after an exchange of words the sisters face became grim. We had forgotten the henna. “We had to buy henna?” asked the cousin. “Of course we have to buy henna,” the sister replied. The servant did not have the money to buy henna in advance, so we were supposed to buy it and bring it with us. Now it was past dark and too dangerous for a woman to walk on the street. The driver had also gone to pick up other family members, so there was no chance we could call him and have him take us to buy henna. Apart from the sleeping and obviously ill boy on the cushion, there was no other man we could ask to get the henna. After some hesitation, the old woman said she would go out and buy it. The sister gave her rupees, and I watched as the woman covered her bright orange kameez with a black abaya, clearly the only abaya she owned, and tied a black scarf around her head and face. Alone in the stranger’s house I took time to carefully observe my surroundings. The walls were two-toned, a dark sea green from the floor to the middle of the wall, and a mint green from the middle to the ceiling. Illuminated green Christmas lights were tacked to wall, spelling out the word “happy” in English. Below a plastic streamer taped to the wall seemed to spell out the word “I'm” but the sentence was left unfinished. On another wall hung a faded blue picture of the hajj, a sign that we were in the home of a Muslim family. Opposite the hajj picture, was a shelf with an old box television. In the corner of the room, tucked away in a small alcove, was an ancient sewing machine. A black iron beast from the industrial age. There was nothing else in the room. The floors were concrete, like the walls, but there were no carpets or rungs, only a floral sheet separated us from the concrete floor. I asked the sister about the dwelling, mistakenly thinking that the entire compound belonged to them. I was then told that this compound was shared by many families. Each family had one room with only a curtain door, but there could be as many as six people in that room. We were not sure how many people were in this woman’s family, but the sister was fairly certain that the sleeping boy and the two young girls also lived in this one room. The kitchen and washrooms were shared by all the residents in the dwelling. Though we had an abundance of time and awkward silence, I didn’t ask any more questions or talk about things in the room. I wondered where they prepared meals, where and how they ate them, how they took baths or used the washroom. I wondered about many things in their daily lives, but I didn’t ask any more questions. The sleeping boy hadn’t stirred a bit since we arrived, and the girls kept their gazes low in deference. Nearly an hour passed since the woman left. We began to worry after thirty minutes, but I could not decipher the source of concern from the sister or cousins. Were they worried that the lady encountered some dangers on the dark streets of Karachi? Or were they just annoyed that she took so long, and worried about their henna designs? Just as these thoughts were floating around in my hear, the women returned with two bottles of henna. They were about 30 rupees (or 30 cents) each. She called the girls over, and the three of them began to do our henna in a rush. One girl did my hands while the woman and another girl did henna for the sister and one cousin. The other cousin said she would wait and do hers tomorrow, so she watched as we got our mehndi done. The girl worked silently on my hands, showing no emotion and making no sound. I passed time by studying the embroidery on her kameez, and wondering how she spent her days when she was not applying mehndi to the hands of a foreigner. The driver picked us up at 9:00 which was the time we had pre-arranged. In the end, we only had 45 minutes to get our mehndi done, which was not enough time for any elaborate design. 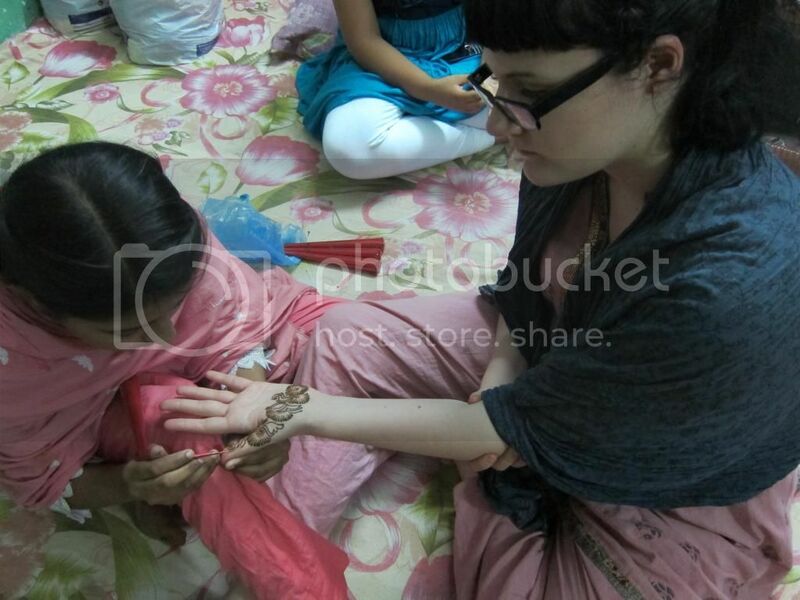 After we returned to the house I was told not to wash my hands for 12 hours or even try to peel of the henna, but the feeling of dry henna on my skin, and that sickening earthy smell made my hands feel wretchedly dirty, so I ended up wiping it off within hours of returning home. The girls were horrified when I came out of the bathroom with my orange hands. The henna is supposed to turn deep red, but on my hands it was a light orange. “You’ve ruined it!” they exclaimed, but by morning the henna had turned dark orange, and by the following afternoon it was burnt orange. Although it was not as beautiful and the deep ruby color of the cousins’ henna, I was still pleased with my simple design. Then, as if our day was not busy enough, I was told that we would perform the Tel ceremony before going to bed. The Tel Baan is a small ritual that takes place in the home of the bride. Guests take turns gathering around a small shrine, dipping their fingers in oil, and rubbing it on the bride’s head. A priest was called to the house to perform the ritual, but we were all shocked to see how young and handsome the priest was. He could not have been over twenty-five years-old, with a checkered shirt a wide black rimmed glasses. He was the most modernly dressed of anyone in the room. During the Tel, one of the cousins called a relative on skype, and held the laptop next to the shrine and recorded the ceremony for the distant loved ones to see. The ancient ceremony stood in stark contrast to the Skype screen. Dinner was served at home, around 11:30 pm, and pots and plates were again passed around to the guests. When we finished eating, and finished talking, I again made it to bed well after midnight.